The River Damsel: My River "Scary"! Do you ever have the desire to try something new, not knowing what to fully expect? Usually, I will venture out and do something new as long as it's safe...Well...a few of my fishing buddies wanted to go do some night fishing. And it was my birthday to boot! So, it sounded like a fun time...I bought a headlamp and I thought that I was ready...Oh, yeah, I also grabbed some mice knowing that this might be the first time that I could actually catch a fish on one! But, no! That wasn't all I needed...as I was going to find out. I needed a secret service agent. Or a bouncer...or, Owl Jones! Yeah, that would have been more like it. It was a nice summer evening in August. The sun was just starting to give way to shadows on the water. We had caught a few fish and were having a good time. As the darkness approached, I grabbed my headlight and adjusted it where I would need it. One step at a time, I carefully went into a pool of water just deep enough to give me a little apprehension, but the current was slow. I was a just a little nervous, being the first time on a pretty big river at night. The moonlight glistening on the river was quite beautiful. This river is famous for Brown and Rainbow trout. And the night fishing is supposed to be some of the finest that you can find. I was quite excited about it all, until we hear, "Splash"! "Splash"! "Splash"! WTF(udge)!!! Rocks were being thrown at us from up above in the trees. The section of the Lower Provo has elevated banks that have thick brush and trees. We couldn't see who was throwing rocks, but this was not very funny, indeed! I really didn't want to get hit in the head. You couldn't see what direction the rock was coming from...so a pretty helpless feeling, if you know what I mean! We yelled back at them to stop the throwing...but, to no avail. So, here we were in the middle of a dark river, and nowhere to go as the missles were being fired at us, so to speak! 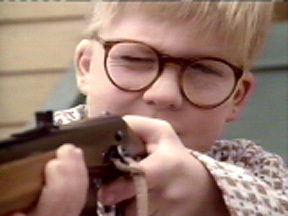 Ralphie would have taken care of things! We called the Sheriff, as we stood in the river and they said that they would come and check it out. They were about a half hour away though. We thought about walking out, but then thought that we were actually safer where we were. We didn't want to get into any scuffle with them either. So, we stayed put. Rocks were being hurled at us and above our heads about every five minutes. It was not fun. I will say that. My legs were cramping up standing in one place. In the dark of the Provo River, I never thought that my birthday would be so adventurous! Or scary...I just wanted to throw a few mice. One of my friends, yelled out that he had a BB gun and he wasn't afraid to use it! (Although, he didn't have it on him at the time) Oh yeah, that did it. Silence...five min...ten min...were they gone? We heard the Sheriff yell out to us that they had arrived. The combed the area and no one was there. So, we all waded out to meet the Sheriff and his search and rescue dogs. Ha! 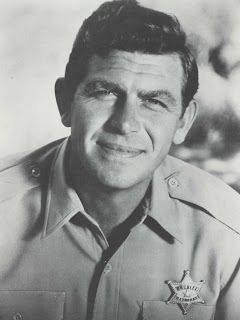 We gave our report and the last thing the Sheriff said to us, was..."If you are going back in to fish, have a good time!" Yeah, right! This night was finished. We all laugh about it now and have a code word "Splash" that we say between us when we fish on the river now. So, I guess that you could say, that fishing with me is...well, interesting! Adventure in every riffle...errr...pool of water, whatever! (And my term, "Incoming" is not related to this night in any way!) We all know the only "Incoming" yell is for brown trout being reeled in...don't we? Hey...I swear this was in the Provo River...not in Mayberry. And for Jay and Howard, who commented on the post before...no, those weren't woodchucks chucking wood.. I think I suggested beavers before... slapping their tails in the water. If you say it was rock throwers, I believe you. People (even just kids) throwing rocks are much scarier than any overgrown rodent (beaver or woodchuck)! Animals don't scare me, but people do. In fairness to Jay...He is right. Quote "I've been fooled into thinking that rocks were being thrown at me in a river at night... more than once... by none other than your friendly neighborhood beaver. When beavers feel threatened or spooked at night, they slap their tails on the surface of the water and it sounds exactly like rather large rocks being tossed in the river. They'll do it repeatedly, trying to intimidate you... until you leave. It's quite terrifying until you figure out the source of the noise... then it just becomes one of the comforting sounds of nature at night. Could it possibly have been beavers? Just the thoughts of a Nocturnal Naturalist." Fred ~ They were smart beavers or dumb humans...take your pick. Bigfoot? They've been known to throw rocks at people. That's a scary thought. Mark ~ I don't think that we need to start any wild rumors about Bigfoot in them hills, do we? Haha. 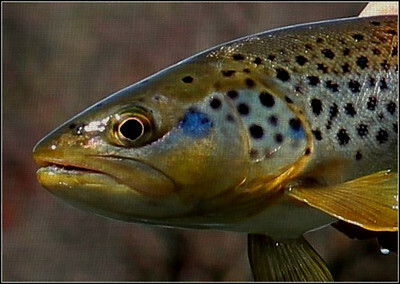 I am thinking "Big Brown Trout" slapping their tales, chasing Mice, Birds, and DAMSELS, too! Up in Idaho we call them fella's "Big Herbies"! WOW,kinda scary,but with my convictions,when trying to fish in peace,and military skills,would have went looking for the "problem",and quietly solve it,or loudly depends if I would be running from a bear,or BIGFOOT!